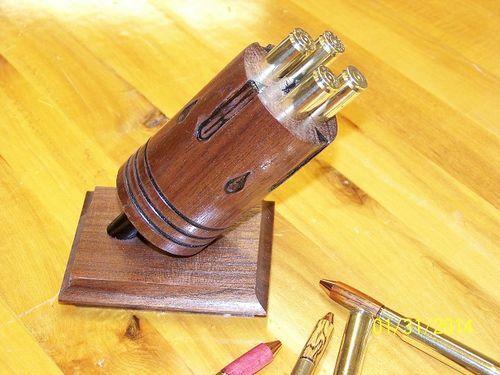 This is a holder that I came up with for displaying 30 caliber bullet pens. It’s made out of 30 year old Walnut scraps from my Grandsons 3 in 1 bed. Thnx for lookin in. Any and all comments, good/bad/ugly are always appreciated. Cool holder and pens, but i think you can not carry those when you are flying. Looks gr8 Roger, and nice assortment of pens! Wow what a nice piece never even came close to coming up with this sort of display. Nice job! love the idea! Cool idea sir. Great job. That’s a slick idea! very innovative! Now you’ll need to come up with the whole pistol – uncock it to see the pens! This has to be one of the best ideas to display bullet pens out there. You are at your best work again Roger. Well done. Great idea Roger. Th lighting on the subject is a low, can’t make out any deco touches to the side of the cylinder. Does this come in a speed loader configuration? You have come up with the coolest pen display ever! Unique and Awesome…great design Roger. Clever display. I like it!